Winemaking or vinification starts with the selection of grapes. After harvesting the grapes, they are taken to a winery for fermentation. Red grapes are made from the pulp fermented along with the skin, which gives it the real colour. Whereas white wine is made by fermenting the juice extracted from the grapes. Yeast may be added to catalyse the fermentation process. At the end of the process, yeast is removed to avoid spoiling of flavor and to leave the wine with a clear, crisp appearance. 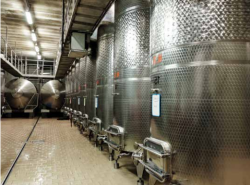 The process to remove yeast is usually performed by introducing diatomaceous (kieselguhr) earth into the fermented wine. The fine particles of diatomaceous earth attract the yeast cells to form clumps, which remain in a suspension referred to as yeast slurry. The yeast slurry is then pumped through a filter press with a Verderflex peristaltic pump, before the wine is finally stored or bottled.